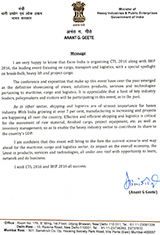 EXIM INDIA is a reputed & all-India recognized premier publishing house having Pan India presence; dedicated to serve Maritime & Logistics Fraternity publishes Daily Newspaper, World Route Maps, Pocket Atlas, Special Issues, THE LINK Magazine, EXIM INDIA YEARBOOK, Aviation Cargo Express (ACE) Newsletter & organises global trade Events (Exhibitions, Conferences & Awards). ABOUT MMI INDIA PVT. 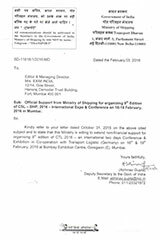 LTD.
MMI India Pvt. 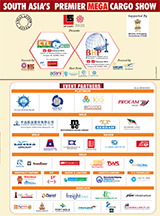 Ltd. is one of the leading organizers of trade fairs in India. A wholly-owned subsidiary of Messe München International, Germany, MMI India organizes B2B trade fairs across various industrial verticals. Worldwide, more than 30,000 exhibitors from over 100 countries and more than two million visitors from over 200 countries participate in fairs and exhibitions in Munich each year. In addition, Messe München International organizes trade fairs in Europe, Asia, Russia, the Middle East and South America.